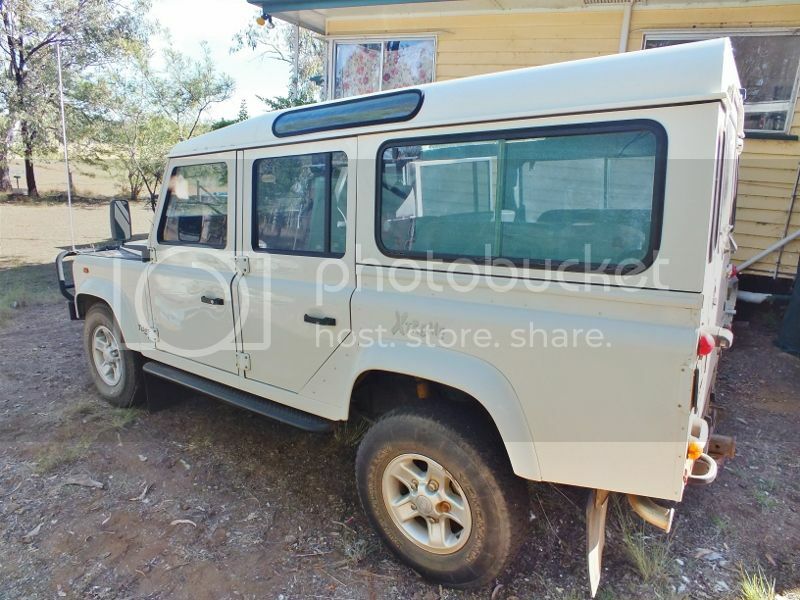 Perentie 'Carryall' 5 seater with 4 troopy seats in the rear. just clicked over 115 000 original ks. With the big tyres fitted made the steering 30% lighter compared to the old, hard original rubber! Nice BFD, tropical roof and push out vents above the dash make for cool runnings. My 02 TD5, hoping to get it back on the road in the near future. Me thinks we need a landrover appreciation/empathy thread? this is our 2nd Triton....the first one was only a 2WD. we traded up and got the 4X4......best thing we EVER did. before the Tritons we had a Holden Rodeo and that thing was "thirsty" on petrol. Lack of funds at the moment, but need to fix a diesel leak, new cooling hoses and new rubber for starters. If it is the fuel pressure regulator on the rear drivers side of the engine, there is a rebuild kit available for ~$40 instead of replacing it for $400ish. As for coolant hoses, ensure you get the tiny 'secret' hose near the turbo. Conceioed by the turbo heat shield. Thanks Dave, I suspect that is what the leak is as that is where the leak is coming from. Is that a clean room rebuild? My new B.L.V an 11/07 T31 X Trail ST 4x4. I've been chasing an XTrail for a good while now and I'm wrapt, great Vehicle ! With 95 Octane Fuel it returns 7.5 Litres per 100 KM Highway/ City and it returned 7.2 Litres per 100KM on a recent Trip to the Northern New England. It was very capable on the Tracks and minor Creek crossings around the Property. Had a couple of over nighters in it already and I can Sleep comfortably in it with one side of the Rear Seats down. I bought Front, Rear and Cargo Area Rubber Matts, Roof Racks, Wired up a set of HID Driving Lights, swapped the front Lighter Socket for a USB Charger, a Redarc Battery Isolator is Wired to a 20 amp Narva Accessory Socket in the back. Soon a Dometic 3 Way Fridge/Freezer and a dual purpose Battery in a Battery Box. X Trails have 1 Rated Recovery Point [ 3.4 Tonne ] at the Front of the Vehicle, will be fitting a Towbar as a far preferred Recovery Point Option just in case. Resurrecting an old thread here but, hey, that's what they're for. Lol. You are gazing with wonder and awe at my new BLV. Well it will be once I get it all set up.....now the work begins. It's a 2008 Nissan Navara D40. I'm going to keep it pretty basic and build a bed in the back, add some storage, put in a dual battery system and put in a table and chairs. Hopefully, I can encourage my most loved to start coming back out camping with me, so I will be starting off nice and simple and hopefully build up from there. By the way, anyone want to buy an awesome Mitsubishi Delica. It is with real sadness that I have to part with it, but I have to. Life moves on. I go on foot, unless I am cutting & carting wood, in which case I use the property vehicle which is a Russian Lada 4WD. My own 4WD is a Triton Diesel, & my wife's 4WD is a Toyota Hilux. Nice. Is your truck lifted or not? I just got my Triton ML, and I'm thinking of adding a 2" suspension lift to improve its off-road performance. Just a little update on my BLV. Since September, I have spentca bit of time doing a few things. The first thing was to update the interior light with an LED. Simple conversion, took about two minutes. Even better, the bloke in the shop did it for me. Easy. I then added a second battery between the cab and the rear wheel. Never done that sort of thing before but slow and steady and double check everything and it worked a treat. Had a fortnight off over Christmas and spent it building a camper rig in the trady canopy. Not quite finished yet but it will give me and Mrs B a good-sized double bed, space for eight 40l boxes which gives me storage for clothes, food, cooking and eating equipment, hygiene (including a bucket shower) and heaps more besides. There may even be room for the dog (but I better give her a bath first, I think). On Friday, I took off the fixed roof racks and added a pair of tracks so I can carry my kayaks. I'm saving up my bottle caps now and will buy the car fridge soon (I hope) and then I will wire it in. Another thing I really want to add is a rear view camera. Both reversing and covering the huge blind spot behind the canopy will be a godsend. My good mate Rosco works for an upholsterer and hopefully he will be able to help me build a couple of mosquito nets for both door openings as Mrs B likes lots of ventilation. And that will be that (For now). Hopefully Bunnings will get more aluminium tube soon so I can finish the box build. Then I can line it with carpet. Also lining it with foam for insulation. Mrs B has promised me with hand on heart that she will make me a dust cover to go over the bed. The table will be strapped down to the bed and the chairs will stand up at the foot of the bed. Fairly simple but functional. Maybe not super bushcrafty but if it means I can encourage my wife to come out with me, it will be worth it. If I could work out how to fit in her sewing machine, we probably wouldn't go home &#55357;&#56838; lol. Pix to follow in the near future, once the main build is finished. We just added another truck. Yesterday we purchased a diesel 4x4 Triton tray back with wide wheels & a long range fuel tank. This one we mostly be used in the forest & will replace our 4x4 Lada Niva which with my longer legs I find uncomfortable to drive these days (Russians must be really short! ).